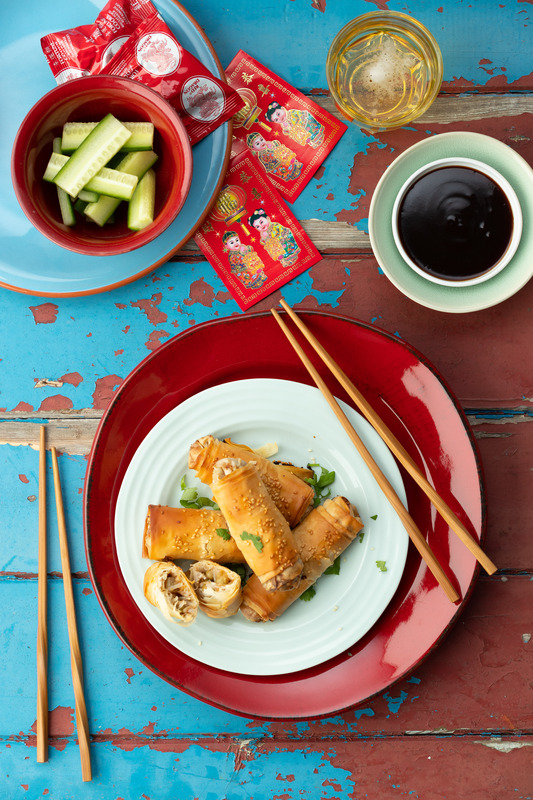 5-A-DAY PORTIONS Three spring rolls counts as 1 of your 5-A-DAY target of fruit and vegetable portions. Pre-heat the oven to 190°C / Gas mark 5 and line 2 baking trays with baking paper. Mix together the vegetables in a large bowl and stir through the 5 spice and 1 tbsp hoisin sauce. Lay out the pastry sheets and cut in half lengthways (to form long strips). Taking one length of filo at a time (keeping the rest of the sheets covered), brush lightly with the melted butter and place 12th of the vegetable mixture (approx. 1 heaped tablespoon) at the bottom of the filo. Fold the sides of the filo in and gently roll up. Brush with melted butter and sprinkle with a few sesame seeds. Place onto the lined tray and repeat the process until all 12 have been made. Bake for 20-25 minutes until golden and crispy. Serve with the remaining hoisin sauce for dipping. Cook’s Tip: Make sure the vegetables are drained really well to make it easier to roll up the filo without it splitting.